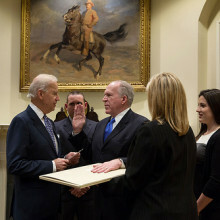 Newly confirmed Central Intelligence Agency Director John Brennan took his oath in a swearing ceremony that was highly unusual. Brennan was not sworn in on a Bible. He was sworn in by Vice President Joe Biden on a “first draft” of the Constitution, which does not contain the Bill of Rights. The first draft included notations from George Washington. While this might sound historic and patriotic. It is anything but that. I really don’t mean to be an a*****e about this. But these vows always carry a great deal of symbolism. And whether he meant to invoke this symbolism or not, the moment at which Brennan took over the CIA happened to exclude (in symbolic form, though presumably not legally) the key limits on governmental power that protect American citizens. The Bible has been used because as the oath is taken it calls the God of the Bible to witness against the person taking the oath. This nonsense of swearing in on the Constitution, even the one that we hold to now as was done by Rep. Kyrsten Sinema (D-AZ), or the Koran is utterly un-American and has not been historically done. The symbolism is clear: according to Brennan and the Obama administration, they will not swear to uphold American citizen’s rights or State’s rights, for that matter, in so cavalierly performing this mockery of an oath. If you think this is unimportant, perhaps you weren’t paying attention when Senator Rand Paul (R-KY) was filibustering. I suggest you educate yourself a bit on that here. Brennan has also been outed as a Muslim, which gives many cause for concern, seeing the growing calls for Shariah law, the State Department’s attempts to recruit jihadists, the Muslim Brotherhood’s infiltration of U.S. government, as well as a Muslim sympathizer in the White House. America’s top spy needs to be a steely-eyed realist, sensitive to emerging threats and keen about our foes’ intent to deceive us. Unfortunately, President Obama’s nominee to head the CIA, Deputy National Security Adviser John Brennan, has shown a tendency to fall for the bait from radical Islamists. Globally, he repeatedly expressed a hope that “moderates” within Iran and its terror proxy Hizballah would steer their respective constituencies away from terrorism. Domestically, he claims that radical Islam does not pose its own, unique threat to American security. He has helped strip language about “radical Islam,” “jihad,” and similar terms from government vernacular, choosing instead to refer to “violent extremism” in an attempt to deny terrorists religious credibility. When it comes to jihad, he stubbornly maintains the word does not belong in conversations about terror, no matter what terrorists themselves say. Despite these positions, some American Islamists still oppose Brennan’s nomination because he is considered the architect of the drone program which has killed scores of al-Qaida terrorists. That should tell him something. But there is little in Brennan’s record to indicate he’ll learn from the experience. Brennan’s complacency regarding the jihad threat was made clear in May 2010, when he expressed a desire to encourage “moderate elements” of Hizballah, which is a State Department-designated terrorist organization. “There is certainly the elements of Hizballah that are truly a concern to us what they're doing. And what we need to do is to find ways to diminish their influence within the organization and to try to build up the more moderate elements,” a Reuters report quoted Brennan saying. That was just the latest in a series of similar statements Brennan has made about Hizballah, the group which ranks second only to al-Qaida in killing Americans in terrorist attacks. The Iranian-founded and funded group “started out as purely a terrorist organization back in the early '80s and has evolved significantly over time,” Brennan said in an Aug. 6, 2009 speech at the Center for Strategic and International Studies. “And now it has members of parliament, in the cabinet; there are lawyers, doctors, others who are part of the Hezbollah organization. This political involvement is a far cry from Hizballah’s genesis as solely a terrorist organization dedicated to murder, kidnapping, and violence. Not coincidentally, the evolution of Hizballah into a fully vested player in the Lebanese political system has been accompanied by a marked reduction in terrorist attacks carried out by the organization. The best hope for maintaining this trend and for reducing the influence of violent extremists within the organization – as well as the influence of extremist Iranian officials who view Hizballah primarily as a pawn of Tehran – is to increase Hizballah's stake in Lebanon’s struggling democratic processes. That lull appears to be over, the report finds. Brennan’s analysis also was refuted by a senior Hizballah leader. Engaging in Lebanese parliamentary politics does not make Hizballah moderate and Hizballah politicians are still part of the mother ship. “The same leadership that directs the parliamentary and government work also leads jihad actions,” Naim Qassem, a deputy to Hizballah leader Hassan Nasrallah, told the Los Angeles Times. The retired Israeli Brigadier General Shimon Shapira observed: “Hizbullah’s own analysis of itself contradicts what Brennan has been writing and stating in recent years. In his 2008 paper, Brennan also advocated direct engagement with Iran despite its well-earned reputation as the world’s leading state sponsor of terrorism. He minimized the threat of Iran’s nuclear weapons program and blamed American rhetoric as “brash labeling” for hardening Tehran’s position toward the United States. Brennan’s recommendations assumed Iranian interest in backing away from terrorism and a nuclear bomb. A presidential envoy – Brennan suggested Colin Powell – would allow the United States to persuade Iran to behave more responsibly and peacefully and rein in its terrorist proxies, Brennan wrote. “Initially, Washington should press Iranian officials to cease their vitriolic anti-American and anti-Israeli rhetoric and to condemn publicly acts of violence that clearly are terrorism. Iran can also take some more tangible steps. For example, Iranian financial and military support to Hezbollah gives Tehran significant leverage over its Lebanese ally, and Iran has the ability to direct Hezbollah to refrain from carrying out any attacks against civilian targets, such as settlements in northern Israel,” he wrote. History again proved Brennan’s assumption wrong. While there is still talk of direct negotiations with Iran over its nuclear weapons program, four years of tempered rhetoric and invitations for negotiation have done nothing to slow Iran’s march toward the bomb. During his time as a White House adviser, Brennan displayed a disturbing tendency to engage with Islamist groups which often are hostile to American anti-terrorism policies at home and abroad. Those meetings confer legitimacy upon the groups as representatives of all Muslim Americans, despite research indicating that the community is far too diverse to have anyone represent its concerns. A Feb. 13, 2010 speech Brennan gave at the New York University School of Law serves as an example. Organized by the Islamic Society of North America (ISNA), the talk became an outlet for Brennan’s argument that terrorists benefit from being identified by religious terms, including “jihadist.” In doing so, Brennan waded into theological revisionism by denying the Quranic foundation exists, even though jihadists routinely cite chapter and verse. Like his positions on Iran and Hizballah, Brennan’s views about using religious references like “jihad” have been uttered repeatedly and consistently. “President Obama [does not] see this challenge as a fight against jihadists. Describing terrorists in this way, using the legitimate term ‘jihad,’ which means to purify oneself or to wage a holy struggle for a moral goal, risks giving these murderers the religious legitimacy they desperately seek but in no way deserve,” Brennan said in an Aug. 6, 2009 speech at the Center for Strategic and International Studies (CSIS). He returned to the narrative in a May 26, 2010 speech, also at CSIS. “Nor do we describe our enemy as ‘jihadists’ or ‘Islamists’ because jihad is a holy struggle, a legitimate tenant of Islam, meaning to purify oneself or one’s community, and there is nothing holy or legitimate or Islamic about murdering innocent men, women and children,” Brennan said. Brennan’s interpretation of jihad stands in stark contrast with how the term has been consistently understood, especially by the intellectual founders of the global Islamist movement. Muslim Brotherhood founder Hassan al-Banna, whose ideas have influenced all subsequent Islamic extremists including Hamas and Al-Qaida, rejected the definition of jihad that Brennan suggests is correct. Sayyid Qutb, al-Banna’s successor in defining Islamist thought, clearly endorsed the idea of violent jihad, suggesting that it should not be fought merely in a defensive manner. Sheikh Yusuf Qaradawi, the senior Muslim Brotherhood imam who the Obama administration reportedly has used in its negotiations with the Taliban, connects jihad with fighting in his book Fiqh of Jihad. In it, he says that Muslims may engage in violent jihad in the event Muslim lands are threatened by or occupied by non-Muslims as he contends is the case with Israel. These Brotherhood treatises are relevant because Brennan’s host, ISNA, was founded by Muslim Brotherhood members in the United States, some of whom remain active with the organization. And, although it denied any Brotherhood connection in 2007, exhibits in evidence in a Hamas-support trial show ISNA’s “intimate relationship with the Muslim Brotherhood.” In addition, the federal judge in the case found “ample evidence” connecting ISNA to Muslim Brotherhood operations known as the Holy Land Foundation, the Islamic Association for Palestine and Hamas. ISNA has sought to publicly moderate its image, yet it has kept radicals such as Jamal Badawi on its board of directors and granted a 2008 community-service award to Jamal Barzinji, a founding father of the Muslim Brotherhood in America, as well as a former ISNA board member. Badawi has defended violent jihad including suicide bombings and has suggested that Islam is superior to secular democracy. Barzinji was named in a federal affidavit as being closely associated with Palestinian Islamic Jihad and Hamas. Barzinji’s name appears in a global phone book of Muslim Brotherhood members recovered by Italian and Swiss authorities in November 2001 from the home of Al-Taqwa Bank of Lugano founder Youssef Nada, one of the leaders of the international Muslim Brotherhood and an al-Qaida financier. Brennan met privately around the time of the NYU speech with another advocate of ignoring the Islamic motivation driving many terrorists. Both Salam al-Marayati and his organization, the Muslim Public Affairs Council (MPAC) have long records of defending suspected terrorists and terror supporters and of arguing the terrorist threat in America is exaggerated. During a 2005 ISNA conference, al-Marayati blasted the idea that Muslims would be used as informants to thwart possible terrorist plots. "Counter-terrorism and counter-violence should be defined by us. We should define how an effective counter-terrorism policy should be pursued in this country,” he said. “So, number one, we reject any effort, notion, suggestion that Muslims should start spying on one another." While Brennan and his associates like Mattson and al-Marayati may wish to disconnect terrorism from religion, this strategy has proven meaningless among those who plot attacks against Americans. Many describe acting out of a belief that America is at war with Islam. Asserting that religious motivation doesn’t exist does nothing to lessen the threat. When Army Pvt. Naser Jason Abdo’s mother asked her son what would drive him to plot a bombing and shooting attack on a restaurant that serves personnel at Fort Hood, Tex., his answer was succinct. "The reason is religion, Mom," he said. Similarly, would-be bombers Faisal Shahzad and Farooque Ahmed justified their attempts to blow people up in New York and Washington as part of a war, a jihad, they felt compelled to join. "This time it's the war against people who believe in the book of Allah and follow the commandments, so this is a war against Allah," Shahzad said at his October 2010 sentencing for trying to detonate a car-bomb in Times Square. "So let's see how you can defeat your Creator, which you can never do. Therefore, the defeat of U.S. is imminent and will happen in the near future, inshallah [God willing], which will only give rise to much awaited Muslim caliphate, which is the only true world order." Ahmed, who scouted subway stations along the Washington, D.C. Metro line in hopes of aiding a bombing plot, acted in response to "an incessant message that is delivered by radical followers of Islam," his lawyer said at Ahmed’s April 2011 sentencing, "that one cannot be true to the faith unless they take action, including violent action, most especially violent action… that is a message that can unfortunately take root in individuals who feel like if they don't do something, that they literally will not find salvation under their faith." He cut the interview short and walked out after the editorial board pressed the point, asking Brennan to distinguish between those historical armed jihads and al-Qaida’s current jihad. Brennan further displayed his eagerness to kowtow to Islamist demands in the fall of 2011. After a small number of materials in FBI training manuals and libraries were found to be excessively negative in describing Islam as a religion and Muslims as a people, Islamist groups demanded a purge of anything they considered offensive. An Oct. 19, 2011 letter to Brennan written by Muslim Advocates Executive Director Farhana Khera and signed by 57 Muslim, Arab, and South Asian organizations demanded that Brennan create “an interagency task force, led by the White House,” that would, among other things, review all counterterror trainers, so as to purge those that the Muslim organizations, which included many with Hamas and Muslim Brotherhood ties, found unacceptable. The task force would also “purge all federal government training materials of biased materials”; “implement a mandatory re-training program for FBI agents, U.S. Army officers, and all federal, state and local law enforcement who have been subjected to biased training”; and more to ensure that only the message about Islam and jihad preferred by the signatories would get through to intelligence and law enforcement agents. Brennan readily agreed, promising in a November 3, 2011 response to Khera written on White House stationery obtained by the Investigative Project on Terrorism, that such an interagency task force was indeed “necessary,” and agreeing to purge training programs of all materials that the Muslim groups found objectionable. To this day, officials have declined to identify those with whom they consulted in identifying the material to be removed. During an April 2012 talk at the New York Police Department, Brennan refused to answer when asked specifically whether Muslim Advocates was among those consulted. But in his letter to Khera, Brennan acquiesced to virtually every demand. “We share your sense of concern over these recent unfortunate incidents, and are moving forward to ensure problems are addressed with a keen sense of urgency,” he wrote. “They do not reflect the vision that the President has put forward, nor do they represent the kind of approach that builds the partnerships that are necessary to counter violent extremism, and to protect our young people and our homeland. American’s greatest strength is its values, and we are committed to pursuing policies and approaches that draw strength from our values and our people irrespective of their race, religion or ethnic background. In addition to purging training material at the behest of Islamist groups, Brennan’s theories about what drives people to plot terrorist acts betrays a further desire to conceal religious dogma. Economic conditions, more than religious beliefs, account for the draw of al-Qaida and other terrorist groups, he has said. That may be true in some cases. But numerous examples expose this as a misguided stereotype. And terrorist leaders – those who recruit terrorist operatives – hail from professional classes. Al-Qaida leader Ayman al-Zawahiri is a physician. So was Palestinian Islamic Jihad founder Fathi Shikaki. Hamas leader Mousa Abu Marzook has a master’s degree and pursued a PhD. Would-be Times Square bomber Faisal Shahzad had a steady job and a decent wage. Many of the 9/11 hijackers were middle class or affluent. The Times of London observed in an April 3, 2005 article that a large percentage of 500 al-Qaida members had discovered that an overwhelming percentage came from middle class or affluent backgrounds. Scholar Daniel Pipes reached a similar conclusion in a Winter 2002 article examining militants held in Egyptian jails. “What is true of Egypt holds equally true elsewhere: Like fascism and Marxism-Leninism in their heydays, militant Islam attracts highly competent, motivated and ambitious individuals. Far from being the laggards of society, they are its leaders,” Pipes wrote. INTERPOL similarly warned in a Sept. 21, 2010 press release that the proliferation of extremist websites showed that al-Qaida recruiters were deliberately targeting middle-class youth. “Speaking at the two-day International Association of Chiefs of Police (IACP) summit (21-22 September) in Paris… INTERPOL Secretary General Ronald K. Noble said that terrorist recruiters exploited the web to their full advantage as they targeted young, middle class vulnerable individuals who were usually not ‘on the radar of law enforcement,’” the INTERPOL press release said. Al-Qaida publications such as Inspire magazine, along with its other media, make it clear that its followers are driven by religious zeal rather than by economics. Its slick, glossy production and the content of its articles appealed to educated people with access to at least some money. "How to Build a Bomb in the Kitchen of Your Mom" is a notorious example. John Brennan’s recipe for fighting terror seems to cast these motivations aside. That’s the mindset poised to direct American intelligence gathering for the next four years.